CFD modeling may be used to evaluate airflow around, and cooling of any electronics and their enclosures. CFD analysis of component level electronics - conjugate heat transfer. 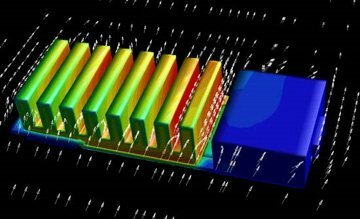 Thermal studies of system level electronics. Data center ventilation and cooling studies. This analysis shows both the heatsink and module surface temperatures with the airflow velocity vectors around the module. 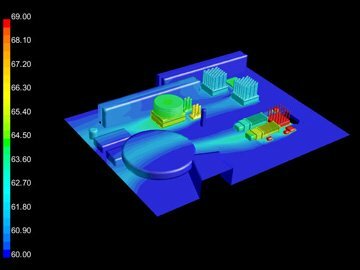 Our CFD analysis also allows for conjugate heat transfer to study the substrate temperatures, semiconductor chip and junction temperatures, as well as the temperatures of the interconnections. The graphical output can depict the module with portions removed to view temperatures inside. After the thermal analysis is complete, Finite Element Analysis (FEA) may be applied to determine thermally induced stresses and cyclic life (see FEA section of this site). A board with several discrete components and opto-electronic modules. This analysis represents a cooling and airflow study of the electronics in a forced convection environment.